Hybrid Drawing Techniques: Design Process and Presentation reaffirms the value of traditional hand drawing in the design process by demonstrating how to integrate it with digital techniques; enhancing and streamlining the investigative process while at the same time yielding superior presentation images. 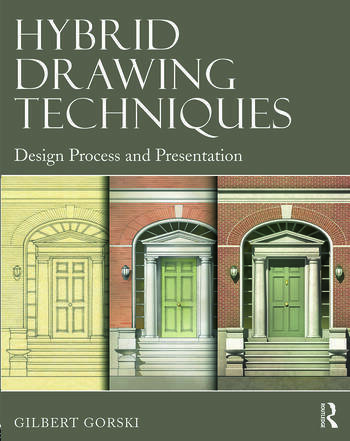 This book is a foundations guide to both approaches: sketching, hardline drawing, perspective drawing, digital applications, and Adobe Photoshop; providing step–by–step demonstrations and examples from a variety of professional and student work for using and combining traditional and digital tools. Also included are sections addressing strategies for using color, composition and light to further enhance one’s drawings. An eResource offers copyright free images for download that includes: tonal patterns, watercolor fields, people, trees, and skies. Gilbert Gorski is a licensed architect and an Associate Professor at the University of Notre Dame, where he holds the James A. and Louise F. Nolen Chair in Architecture. He is a recipient of a National Award for Collaborative Achievement by the American Institute of Architects and has twice been awarded the Hugh Ferriss Memorial Prize by the American Society of Architectural Illustrators. He has also taught studios at the Illinois Institute of Technology and at the School of the Art Institute of Chicago.